Recover the blood of a god for Martin. Talk to Martin and learn of the "blood of the gods". Explore the catacombs of Sancre Tor to find and defeat the first Undead Blade to learn about a curse. Defeat the three remaining undead Blades to free them of the curse. Kill the undead Warden to access the rest of the tomb, and watch the Blade Ghosts dispel the evil enchantment. Obtain the Armor of Tiber Septim and bring it back to Martin. Martin tells you the next ingredient to open the portal is the Blood of the Divines. Speak to Jauffre to learn that the blood of Tiber Septim (who became the god Talos) can probably be found on his armor in Sancre Tor. These catacombs were sealed by the first Grandmaster of the Blades and any who have tried to explore have never returned. Jauffre gives you a key to Sancre Tor and wishes you luck. Sancre Tor is now marked on your map. It is located on the northern road from Bruma to Chorrol. Above ground, it is a huge ruined fort with a few leveled undead guarding a couple of chests and a Sidri-Ashak Rune Stone. The entrance to the underground portion can be found in the large central tower. The interior of Sancre Tor is filled primarily with ethereal undead (ghosts and wraiths). Since these creatures are immune to normal weapon damage, you will need a silver, daedric, or enchanted weapon if you want to attack them. Alternatively, an Ancient Akaviri Katana will also kill ethereal undead, and they can be freely taken from the blade skeletons after you kill them. A Journeyman in Hand to Hand can use their fists to kill the ethereal undead. You will also encounter several Undead Blades. The first one will turn into the Ghost of Rielus once you defeat it. Rielus tells you that he was one of four Blades sent to the catacombs by Tiber Septim to discover the source of the evil infestation. The four were captured by the Underking Zurin Arctus, and bound to haunt the catacombs after death. A spell was also put on the passage to the tomb where the armor lies. Approaching it is impossible without freeing all of the Blades. You will take constant Frost Damage, be hit with the "Breath of the Underking" which drains Speed and Willpower, and finally hit an invisible barrier at the end of the corridor. Rielus tells you to find and free his three companions so the four of them can undo the curse placed on the Shrine by the Underking. Another Undead Blade can be found in the Catacombs, another in the Hall of Judgement, and the last in the Prison; killing them will release the ghosts of Alain, Casnar and Valdemar respectively. Note that each of the four Blades has a leveled magical item (Amulet of the Ansei, Valdemar's Shield, and two swords: Mishaxhi's Cleaver and Northwind). In the prison area you need to open a locked door: either unlock it yourself or kill the undead Warden Kastav for his key. When you have freed all four, proceed into the Tomb of the Reman Emperors to observe them restoring the shrine. Once the evil enchantment has been dispelled, go and get the Armor of Tiber Septim. Return the armor to Martin in Cloud Ruler Temple. He will thank you and let you know he's discovered the third ingredient. You may notice that Martin has set up another table in his impromptu study area while you were gone. There are two skill books (The Refugees, Light Armor and The Doors of Oblivion, Conjuration), a third non-skill book (The Firmament), an apprentice calcinator, and two paint brushes. Followers will not follow you into Sancre Tor. The Undead Blades can be looted for unenchanted armor and weapons as well. Though identical in appearance to normal Blades gear, they possess slight differences in quality. The Ancient Blades Shield and Helmet are worse (heavier, with less durability and protection) than the standard, but the Ancient Akaviri Katana is slightly better, as it is more durable, has better damage, lighter weight, and can harm ethereal enemies. It is possible, though difficult, to use area of effect spells to move the armor toward you. It can be picked up though the invisible barriers. Telekinesis cannot be used to obtain the armor. 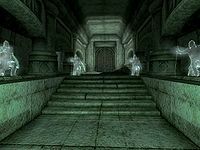 Though Martin states that "the gods have no artifacts", several artifacts apparently created by the Aedra appear in the Elder Scrolls series. In Oblivion, items like the Brush of Truepaint and Crusader's Relics are technically Aedric artifacts. Do not let the Undead Blades follow you outside of the ruin. If you kill them outside, their ghosts may not be able to re-enter, breaking the quest and further quests in the main storyline. The Undead Blade Alain may appear twice, in both the Prison and the Hall of Judgement. You can fix this by going to a save file from before you kill all four ghosts and entering the console command player.placeatme 000364bb. The missing Undead Blade will appear - kill him and he will go where he is supposed to. There was supposed to be a reward of two Fame points for this quest, but due to a scripting error, there's none. 5 I should speak to Martin about the second item he needs for the ritual to open a portal to Mankar Camoran's realm of Paradise. 10 Martin has deciphered a second item needed for the ritual: the 'blood of a Divine'. He could not imagine a way to obtain such a thing, until Jauffre suggested a solution: the blood of Tiber Septim, who was once mortal but became a god. I should ask Jauffre how to obtain this blood. I need to go to Sancre Tor, find the Shrine of Tiber Septim and bring his ancient armor back to Martin. 30 I have found the entrance to the catacombs of Sancre Tor. I should search them for the Shrine of Tiber Septim. 40 I have found the Shrine of Tiber Septim. Its entrance is blocked by some kind of enchantment. I will have to find some way to dispel the enchantment in order to reach the Armor inside the shrine. I should free the spirits of the other cursed Blades of Sancre Tor, so that they can help to dispel the Underking's evil enchantment from the Shrine of Tiber Septim. 51 I have destroyed the second of the cursed Blades guarding Sancre Tor, freeing his spirit to help his companions lift the Underking's enchantment from the Shrine of Tiber Septim. I should continue to search for the other two undead Blades. 52 I have destroyed the third of the cursed Blades guarding Sancre Tor. I need to find and destroy the last of the cursed Blades, so that his freed spirit can help the ghosts of his companions dispel the evil enchantment blocking the way to the Shrine of Tiber Septim. 53 All of the cursed Blades of Sancre Tor have been destroyed. Their freed spirits have gone to the Shrine of Tiber Septim to try to dispel the enchantment laid upon it by the Underking long ago. I should go to the Shrine at once to see if they succeed in their final quest. 70 The ghosts of the four cursed Blades have dispelled the evil enchantment on the Shrine of Tiber Septim. The way to the Armor is now open. 80 I have the Armor of Tiber Septim. Now to take it to Martin at Cloud Ruler Temple. 90 I gave Martin the Armor of Tiber Septim. He was able to recover Tiber Septim's blood from it, which he needed for the Mysterium Xarxes ritual. It is possible to use the console to advance through the quest by entering setstage MQ09 stage, where stage is the number of the stage you wish to complete. It is not possible to un-complete (i.e. go back) quest stages. See SetStage for more information. This page was last modified on 27 May 2018, at 20:40.